The Xiongnu (Chinese: 匈奴; pinyin: Xiōngnú; Wade-Giles: Hsiung-nu); were a nomadic people from Central Asia, generally based in present day Mongolia and China. From the third century B.C.E. they controlled a vast steppe empire extending west as far as the Caucasus. They were active in the areas of southern Siberia, western Manchuria and the modern Chinese provinces of Inner Mongolia, Gansu and Xinjiang. Very ancient (perhaps legendary) historic Chinese records say that the Xiongnu descended from a son of the final ruler of China's first dynasty, the Xia Dynasty, the remnants of which were believed by the Chinese of the Spring and Autumn Period to be the people of the state of Qǐ (杞). However, due to internal differences and strife, the Xiongnu fled north and north-west. 5 Did the Northern Xiongnu Become the Huns? Relations between the Han Chinese and the Xiongnu were complicated. Emperor Qin Shi Huangdi (r. 221 - 206 B.C.E. ), who unified China under the Qin, built the Great Wall, extending 2,600 miles from modern Gansu Province in the west to the Liaodong Peninsula in the east, to defend China from the cavalry raids of the Xiongnu. Eventually the Han and the Xiongnu reached a peace settlement which included trade and marriage treaties and periodic gifts to the Xiongnu in exchange for the recognition of the Great Wall as a mutual border. This proved too costly and ineffective, and a series of conflicts between 133 B.C.E. and 89 C.E. culminated in the Han driving the northern Xiongnu beyond the Caspian Sea. Following the fall of the Han dynasty, the Xiongnu controlled much of northern China. In 304, a Sinicized Xiongnu, Liu Yuan, proclaimed himself Emperor of Han. In 391, the Wei dynasty defeated a powerful Xiongnu tribe and forced the survivors to give up their nomadic ways. By the T’ang dynasty, the Xiongnu culture had disappeared. Some historians believe that the Huns originated from the Xiongnu. The overwhelming amount of information on the Xiongnu comes from Chinese sources. What little is known of their titles and names come from Chinese transliterations. 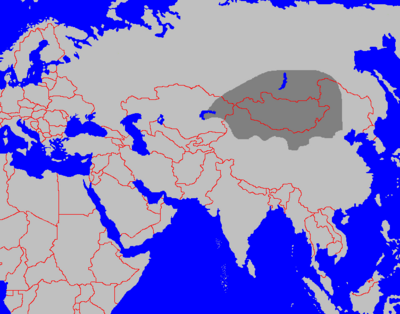 Only about 20 words belonging to the Altaic languages are known, and only a single sentence from Chinese documents. The original geographic location of Xiongnu is generally placed at the Ordos Desert. According to Sima Qian, the Xiongnu were descendants of Chunwei (淳維), possibly a son of Jie, the final ruler of the Xia Dynasty. There is no direct evidence to either refute or support this theory. There is no scholarly consensus concerning the language of the Xiongnu. Based on historical analysis conducted from the early nineteenth century through the twentieth century, some scholars, including Jean-Pierre Abel-Rémusat, Julius Klaproth, Shiratori Kurakichi, Gustaf John Ramstedt, Annemarie von Gabain and Omeljan Pritsak, believe it was a Turkic language; others, like Paul Pelliot, insist on a Mongolic origin; Albert Terrien de Lacouperie considered them to be multi component groups. Lajos Ligeti was the first to suggest that the Xiongnu spoke a Yeniseian language. In the early 1960s, Edwin Pulleyblank was the first to expand upon this idea with credible evidence. In 2000, Alexander Vovin reanalyzed Pulleyblank's argument and found further support for it by utilizing the most recent reconstruction of Old Chinese phonology by Starostin and Baxter, and a single Chinese transcription of a sentence in the language of the Jie (a member tribe of the Xiongnu confederacy). Previous Turkic interpretations of that sentence do not match the Chinese translation as precisely as the interpretation using Yeniseian grammar. Recent genetics research in 2003 confirmed the studies indicating that the Turkic peoples, originated from the same area and therefore are possibly related. At archaeological sites in Yinshan and Helanshan, dating from the ninth millennium B.C.E. to nineteenth century, rock art consisting mainly of petroglyphs (engraved signs) and a few painted images have been discovered. Scholars such as Ma Liqing, who presumed the petroglyphs to be the sole extant writing of the Xiongnu, have made a comparison between the petroglyphs and the Orkhon script (the earliest known Turkic alphabet), and argued for a connection between them. In 209 B.C.E., just three years before the founding of the Han Dynasty, the Xiongnu were brought together in a powerful confederacy under a new shanyu named Modu Shanyu (known as Modu to Chinese and Mete in Turkish). The Xiongnu's political unity transformed them into a much more formidable foe by enabling them to concentrate larger forces and exercise better strategic coordination. The reason for the confederation, however, remains unclear. It has been suggested that the unification of China prompted the nomads to rally around a political center in order to strengthen their position. Another theory is that the reorganization was their response to the political crisis that overtook them 215 B.C.E., when Qin armies evicted them from pastures on the Yellow River. After forging internal unity, Modu expanded the empire on all sides. To the north he conquered a number of nomadic peoples, including the Dingling of southern Siberia. He crushed the power of the Donghu of eastern Mongolia and Manchuria, as well as the Yuezhi in the Gansu corridor. He was able, moreover, to recover all the lands taken by the Qin general Meng Tian. Before the death of Modu in 174 B.C.E., the Xiongnu had driven the Yuezhi from the Gansu corridor completely and asserted their presence in the Western Regions in modern Xinjiang. Under Modu, a dualistic system of political organization was formed. The left and right branches of the Xiongnu were divided on a regional basis. The shanyu or shan-yü (“Supreme Ruler,” equivalent to the Chinese "Son of Heaven") exercised direct authority over the central territory. The Longcheng (蘢城), near Koshu-Tsaidam in Mongolia, was established as the annual meeting place and de facto capital. Emperor Qin Shi Huangdi (r. 221 - 206 B.C.E. ), who unified China under the Qin, built the Great Wall, extending 2600 miles from modern Gansu Province in the west to the Liaodong Peninsula in the east, to defend China from the raids of the Xiongnu. In the winter of 200 B.C.E., following a siege of Taiyuan, Emperor Gao personally led a military campaign against Modu. At the battle of Baideng, he was ambushed reputedly by 300,000 elite Xiongnu cavalry. The emperor was cut off from supplies and reinforcements for seven days, only narrowly escaping capture. After the defeat at Pingcheng, the Han emperor abandoned a military solution to the Xiongnu threat. Instead, in 198 B.C.E., the courtier Liu Jing (劉敬) was dispatched for negotiations. The peace settlement eventually reached between the parties included a Han princess given in marriage to the shanyu (called heqin 和親 or "harmonious kinship"); periodic gifts of silk, liquor and rice to the Xiongnu; equal status between the states; and the Great Wall as mutual border. This first treaty set the pattern for relations between the Han and the Xiongnu for some 60 years. Up to 135 B.C.E., the treaty was renewed no less than nine times, with an increase of "gifts" with each subsequent agreement. In 192 B.C.E., Modu even asked for the hand of the widowed Empress Lü. His son and successor, the energetic Jiyu (稽粥), known as the Laoshang Shanyu (老上單于), continued his father's expansionist policies. Laoshang succeeded in negotiating with Emperor Wen, terms for the maintenance of a large-scale government-sponsored market system. While the Xiongnu benefited from the marriage treaties, from the Chinese perspective they were costly and ineffective. Laoshang showed that he did not take the peace treaty seriously. On one occasion his scouts penetrated to a point near Chang'an. In 166 B.C.E. he personally led 140,000 cavalry to invade Anding, reaching as far as the imperial retreat at Yong. In 158 B.C.E., his successor sent 30,000 cavalry to attack the Shang commandery and another 30,000 to Yunzhong. Han China began making preparations for a military confrontation during the reign of Emperor Wen. An opportunity came in 133 B.C.E., following an abortive trap to ambush the shanyu at Mayi. By that point the Han empire was consolidated politically, militarily, and financially, and was led by an adventurous pro-war faction at court. In that year, Emperor Wu reversed the decision he had made the year before to renew the peace treaty. Full scale war broke out in the autumn of 129 B.C.E., when 40,000 Chinese cavalry made a surprise attack on the Xiongnu at the border markets. In 127 B.C.E., the Han general Wei Qing retook the Ordos. In 121 B.C.E., the Xiongnu suffered another setback when Huo Qubing led a force of light cavalry westward out of Longxi, and within six days, fought his way through five Xiongnu kingdoms. The Xiongnu Hunye king was forced to surrender with 40,000 men. In 119 B.C.E. both Huo and Wei, each leading 50,000 cavalrymen and 100,000 foot soldiers, and advancing along different routes, forced the shanyu and his court to flee north of the Gobi Desert. Major logistical difficulties limited the duration and long-term continuation of these campaigns. According the analysis of Yan You (嚴尤), there were two difficulties: the problem of supplying food across long distances; and the cold weather in the northern Xiongnu lands, which was difficult for Han soldiers who could never carry enough fuel. According to official reports, Xiongnu's side lost 80,000 to 90,000 men; out of the 140,000 horses the Han forces had brought into the desert, fewer than 30,000 returned to China. As a result of these battles, the Chinese controlled the strategic region from the Ordos and Gansu corridor to Lop Nor. They succeeded in separating the Xiongnu from the Qiang peoples to the south, and also gained direct access to the Western Regions. Ban Chao, Protector General (都護; Duhu) of the Han Dynasty, embarked with an army of 70,000 men on a campaign against the Xiongnu insurgents who were harassing the trade route we now know as the Silk Road. His successful military campaign saw the subjugation of one Xiongnu tribe after another, and those fleeing Xiongnu insurgents were pursued by Ban Chao's army of entirely mounted-infantry and light cavalry over a vast distance westward into the territory of the Parthians and beyond the Caspian Sea, reaching the region of what is present-day Ukraine. Upon his return, Ban Chao established a base on the shores of the Caspian Sea, after which he reportedly also sent an envoy named Gan Ying to Daqin (Rome). Ban Chao was created the Marquess of Dingyuan (定遠侯; "the Marquess who stabilized faraway places") for his services to the Han Empire and returned to the capital Loyang at the age of seventy, where he died in the year 102. Following his death, the power of the Xiongnu in Western Territory increased again, and the Chinese were never again able to reach so far to the west. As the Xiongnu empire expanded, it became clear that the original leadership structures lacked flexibility and could not maintain effective cohesion. The traditional succession of the eldest son became increasingly ineffective in meeting wartime emergencies in the first century B.C.E. To combat the problems of succession, Huhanye Shanyu (58 B.C.E.-31 B.C.E.) laid down the rule that his heir apparent must pass the throne on to a younger brother, and this pattern of fraternal succession became the norm. The growth of regionalism became evident around this period, when local kings refused to attend the annual meetings at the shanyu's court. During this period, shanyu were forced to develop power bases in their own regions to secure the throne. In the period 114 B.C.E. to 60 B.C.E., the Xiongnu produced altogether seven shanyu. Two of them, Chanshilu and Huyanti, assumed the office while still children. In 60 B.C.E., Tuqitang, the "Worthy Prince of the Right," became Wuyanjuti Shanyu. No sooner had he come to the throne, than he began to purge from power those whose base lay in the left group. The nobility of the left retaliated in 58 B.C.E. by putting forward Huhanye as their own shanyu. During 57 B.C.E. there was a struggle for power among five regional groupings, each with its own shanyu. In 54 B.C.E. Huhanye abandoned his capital in the north after being defeated by his brother, the Zhizhi Shanyu. In 53 B.C.E. Huhanye (呼韓邪) decided to enter into tributary relations with Han China. The original terms insisted on by the Han court were that, first, the shanyu or his representatives should come to the capital to pay homage; secondly, the shanyu should send a hostage prince; and thirdly, the shanyu should present tribute to the Han emperor. The political status of the Xiongnu in the Chinese world order was reduced from that of a "brotherly state" to that of an "outer vassal" (外臣). During this period, however, the Xiongnu maintained political sovereignty and full territorial integrity. The Great Wall of China continued to serve as the line of demarcation between Han and Xiongnu. Huhanye sent his son, the "wise king of the right," Shuloujutang, to the Han court as hostage. In 51 B.C.E. he personally visited Chang'an to pay homage to the emperor on the Chinese New Year. On the financial side, Huhanye was amply rewarded in large quantities of gold, cash, clothes, silk, horses and grain for his participation. Huhanye made two more homage trips, in 49 B.C.E. and 33 B.C.E. ; with each one the imperial gifts were increased. On the last trip, Huhanye took the opportunity to ask to be allowed to become an imperial son-in-law. As a sign of the decline in the political status of the Xiongnu, Emperor Yuan refused, giving him instead five ladies-in-waiting. One of them was Wang Zhaojun, famed in Chinese folklore as one of the Four Beauties. When Zhizhi learned of his brother's submission, he also sent a son to the Han court as hostage in 53 B.C.E. Then twice, in 51 B.C.E. and 50 B.C.E., he sent envoys to the Han court with tribute. But having failed to pay homage personally, he was never admitted to the tributary system. In 36 B.C.E., a junior officer named Chen Tang, with the help of Gan Yanshou, protector-general of the Western Regions, assembled an expeditionary force that defeated Zhizhi and sent his head as a trophy to Chang'an. Tributary relations were discontinued during the reign of Huduershi (18-48 C.E. ), corresponding to the political upheavals of the Xin Dynasty in China. The Xiongnu took the opportunity to regain control of the western regions, as well as neighboring peoples such as the Wuhuan. In 24 C.E., Hudershi even talked about reversing the tributary system. The Xiongnu's new power was met with a policy of appeasement by Emperor Guangwu (5 B.C.E. - March 29, 57 C.E.). At the height of his power, Huduershi even compared himself to his illustrious ancestor, Modu. Due to growing regionalism among the Xiongnu, however, Huduershi was never able to establish unquestioned authority. When he designated his son as heir apparent (in contravention of the principle of fraternal succession established by Huhanye), Bi, the Rizhu king of the right, refused to attend the annual meeting at the shanyu's court. As the eldest son of the preceding shanyu, Bi had a legitimate claim to the succession. In 48, two years after Huduershi's son Punu ascended the throne, eight Xiongnu tribes in Bi's powerbase in the south, with a military force totaling 40,000 to 50,000 men, acclaimed Bi as their own shanyu. Throughout the Eastern Han period, these two groups were called the southern Xiongnu and the northern Xiongnu, respectively. Hard pressed by the northern Xiongnu and plagued by natural calamities, Bi brought the southern Xiongnu into tributary relations with Han China in 50. The tributary system was considerably tightened to keep the southern Xiongnu under Han supervision. The shanyu was ordered to establish his court in the Meiji district of Xihe commandery. The southern Xiongnu were resettled in eight frontier commanderies. At the same time, large numbers of Chinese were forced to migrate to these commanderies, where mixed settlements began to appear. The northern Xiongnu were dispersed by the Xianbei in 85 and again in 89 by the Chinese during the Battle of Ikh Bayan, of which the last Northern Shanyu was defeated and fled over to the north west with his subjects. Economically, the southern Xiongnu relied almost totally on Han assistance. Tensions were evident between the settled Chinese and practitioners of the nomadic way of life. Thus, in 94 Anguo Shanyu joined forces with newly subjugated Xiongnu from the north and started a large scale rebellion against the Han. Towards the end of the Eastern Han, the southern Xiongnu were drawn into the rebellions then plaguing the Han court. In 188, the shanyu was murdered by some of his own subjects for agreeing to send troops to help the Han suppress a rebellion in Hebei; many of the Xiongnu feared that it would set a precedent for unending military service to the Han court. The murdered shanyu's son succeeded him, but was then overthrown by the same rebellious faction in 189. He traveled to Luoyang (the Han capital) to seek aid from the Han court, but at this time the Han court was in disorder from the clash between Grand General He Jin and the eunuchs, and the intervention of the warlord Dong Zhuo. The shanyu named Yufuluo (於扶羅), but entitled Chizhisizhu (特至尸逐侯), had no choice but to settle down with his followers in Pingyang, a city in Shanxi. In 195, he died and was succeeded by his brother Hucuquan. In 216, the warlord-statesman Cao Cao detained Hucuquan in the city of Ye, and divided his followers in Shanxi into five divisions: left, right, south, north, and center. This was aimed at preventing the exiled Xiongnu in Shanxi from engaging in rebellion, and also allowed Cao Cao to use the Xiongnu as auxiliaries in his cavalry. Eventually, the Xiongnu aristocracy in Shanxi changed their surname from Luanti to Liu in order to enhance their prestige, claiming that they were related to the Han imperial clan through the old intermarriage policy. After Hucuquan, the Xiongnu were partitioned into five local tribes. The complicated ethnic situation of the mixed frontier settlements instituted during the Eastern Han had grave consequences, not fully apprehended by the Chinese government until the end of the third century. By 260, Liu Qubei had organized the Tiefu confederacy in the north east, and by 290, Liu Yuan was leading a splinter group in the south west. At that time, non-Chinese unrest reached alarming proportions along the whole of the Western Jin frontier. In 304 the sinicised Liu Yuan, a grandson of Yufuluo Chizhisizhu, stirred up descendants of the southern Xiongnu in rebellion in Shanxi, taking advantage of the War of the Eight Princes then raging around the Western Jin capital Luoyang. Under Liu Yuan's leadership, they were joined by a large number of frontier Chinese and became known as Bei Han. Liu Yuan used 'Han' as the name of his state, hoping associate his reign with the lingering nostalgia for the glory of the Han dynasty, and established his capital in Pingyang. The Xiongnu use of large numbers of heavy cavalry with iron armor for both rider and horse gave them a decisive advantage over Jin armies already weakened and demoralized by three years of civil war. In 311, they captured Luoyang, and with it the Jin emperor Sima Chi (Emperor Huai). In 316, the next Jin emperor was captured in Chang'an, and the whole of north China came under Xiongnu rule while remnants of the Jin dynasty survived in the south (known to historians as the Eastern Jin). In 318, after suppressing a coup by a powerful minister in the Xiongnu-Han court (in which the Xiongnu-Han emperor and a large proportion of the aristocracy were massacred), the Xiongnu prince Liu Yao moved the Xiongnu-Han capital from Pingyang to Chang'an and renamed the dynasty as Zhao (it is hence known to historians collectively as Han Zhao). However, the eastern part of north China came under the control of a rebel Xiongnu-Han general of Jie (probably Yeniseian) ancestry named Shi Le. Liu Yao and Shi Le fought a long war until 329, when Liu Yao was captured in battle and executed. Chang'an fell to Shi Le soon after, and the Xiongnu dynasty was wiped out. North China was ruled by Shi Le's Later Zhao dynasty for the next 20 years. The northern Tiefu branch of the Xiongnu gained control of the Inner Mongolian region in the ten years between the conquest of the Tuoba Xianbei state of Dai by the Former Qin empire in 376, and its restoration in 386 as the Northern Wei. After 386, the Tiefu were gradually destroyed by or surrendered to the Tuoba, with the submitting Tiefu becoming known as the Dugu. Liu Bobo, a surviving prince of the Tiefu fled to the Ordos Loop, where he founded a state called the Xia (named for the Xiongnu's supposed ancestry from the Xia dynasty) and changed his surname to Helian (赫連). The Helian-Xia state was conquered by the Northern Wei in 428-431, who killed thousands of members of the ruling nobility, and forced the survivors to give up their nomadic lifestyle and live in permanent settlements in Mongolia. The Xiongnu thenceforth effectively ceased to play a major role in Chinese history, assimilating into the Xianbei and Han ethnicities. The Juqu were a branch of the Xiongnu whose leader, Juqu Mengxun, took over the Northern Liang by overthrowing the former puppet ruler Duan Ye. By 439, the Juqu were destroyed by the Northern Wei, while their remnants settled in the Gaochang before being destroyed by the Rouran. In the 1920s, Pyotr Kozlov's excavations of the royal tombs dated to about first century C.E. at Noin-Ula in northern Mongolia provided a glimpse into the lost world of the Xiongnu. Other archaeological sites have been unearthed in Inner Mongolia and elsewhere; they represent the neolithic and historical periods of the Xiongnu's history. These sites included the Ordos culture, many of them have been identified as Xiongnu culture. From their skeletal remains and artifacts, the region is known to have been occupied predominantly by Mongoloids. Did the Northern Xiongnu Become the Huns? As in the case of the Rouran with the Avars, oversimplifications have led to the Xiongnu often being identified with the Huns, who began to populate the frontiers of Europe by 370 C.E. 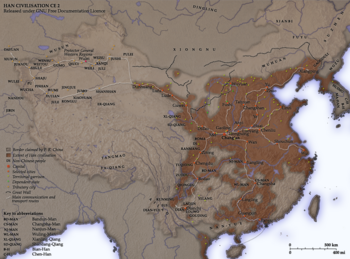 The connection started with the writings of the eighteenth century French historian Chrétien-Louis-Joseph de Guignes, who noticed that a few of the barbarian tribes north of China associated with the Xiongnu had been named "Hun" with varying Chinese characters. This theory remains at the level of speculation, although it is accepted by some scholars, including Chinese ones. DNA testing of Hun remains has not proven conclusive in determining the origin of the Huns. Linguistically, it is important to understand that "xiōngnú" is only the modern standard Mandarin pronunciation (based on the Beijing dialect) of "匈奴." The sound of the character "匈" during the fourth–sixth centuries C.E. has been reconstructed as /hoŋ/. The supposed sound of the first character has a clear similarity with the name "Hun" in European languages. Whether this is evidence of kinship or mere coincidence is hard to tell. It could lend credence to the theory that the Huns were in fact descendants of the Northern Xiongnu who migrated westward, or that the Huns were using a name borrowed from the Northern Xiongnu, or that these Xiongnu made up part of the Hun confederation. The traditional etymology of "匈" is that it is a pictogram of the facial features of one of these people, wearing a helmet, with the "x" under the helmet representing the scars they inflicted on their faces to frighten their enemies. However, there is no actual evidence for this interpretation. In modern Chinese, the character "匈" is used in four ways: to mean "chest" (written 胸 in Chinese characters); in the name Xiōngnú (匈奴; "Xiongnu"); in the word 匈人 (Xiōngrén "Hun [person]"); and in the name Xiōngyálì (匈牙利; "Hungary"). The last of these is a modern coinage, which may derive from the belief that the Huns were related to the Xiongnu. The second character, "奴," appears to have no parallel in Western terminology. Its contemporary pronunciation was /nhō/, and it means "slave," although it is possible that it has only a phonetic role in the name 匈奴. There is almost certainly no connection between the "chest" meaning of 匈 and its ethnic meaning. There might conceivably be some sort of connection with the identically pronounced word "凶," which means "fierce," "ferocious," "inauspicious," "bad," or "violent act." Most probably, the word derives from the tribe's own name for itself as a semi-phonetic transliteration into Chinese, and the character was chosen somewhat arbitrarily, a practice that continues today in Chinese renderings of foreign names. Although phonetic evidence linking the Xiongnu with the Huns is not conclusive, new evidence from Central Asia might support a political and cultural link between the Xiongnu and the Huns. Translations of the term “Xiongnu” into “Hun,” and “Hun” into “Xiongnu” have been found in Central Asian sources of the fourth century. In the Sogdian Ancient Letters, the Xiongnu of Northern China are named “xwn,” while in the Buddhist translations by Dharmaraksa (b. 230 C.E. ), “Huna” in the Indian text is translated “Xiongnu.” There is also archaeological evidence; Hunnic cauldrons are similar to those of the Ordos Xiongnu, and the cauldrons were apparently used in similar rituals, because they have been found buried in river banks both in Hungary and in the Ordos. Another possible link between the Xiongnu and the Huns has been detected in an old Byzantine codex dating back to the fourteenth century. Inside the codex was a list in a Slav language from the early Middle Ages, which was decoded and translated by Omeljan Pritsak professor of history and language (at Lvov, Hamburg and Harvard University) in 1955 and named: "The Old-Bulgarian King List"  (Nominalia of the Bulgarian Khans). This contains the names and descendants of the Hun kings` dynasty. At the beginning of it is the great Mao-Tun (Modu shanyu), who established the Xiongnu Empire. Among the other descendants` names is the name of Ernakh, the youngest son of Attila The Hun. It indicates that the rulers of the Xiongnu and the Huns were from the same dynasty, which supports the possibility that Xiongnu eventually became the Huns. ↑ Zhonghan Wang. 2004. Outlines of Ethnic Groups in China. (Taiyuan: Shanxi Education Press. ISBN 7544026604), 133. ↑ GENG Shi-min,On Altaic Common Language and Xiongnu Language, Wanfang Data. Retrieved October 19, 2007. ↑ Alexander Vovin, "Did the Xiongnu speak a Yeniseian language?." Central Asiatic Journal 44(1) (2000): 87-104. ↑ Christine Keyser-Tracqui, Eric Crubezy, and Bertrand Ludes, Nuclear and mitochondrial DNA analysis of a 2,000-year-old necropolis in the Egyin Gol Valley of Mongolia, American Journal of Human Genetics. Retrieved October 19, 2007. ↑ Ihsan, September 2005, Origins of the Türük People, All Empires.com. Retrieved October 19, 2007. ↑ Nancy Touchette, Ancient DNA Tells Tales from the Grave, Craig Venter Institute. "Skeletons from the most recent graves also contained DNA sequences similar to those in people from present-day Turkey. This supports other studies indicating that Turkic tribes originated at least in part in Mongolia at the end of the Xiongnu period." Retrieved October 19, 2007. ↑ Paola Demattè, Writing the Landscape: the Petroglyphs of Inner Mongolia and Ningxia Province (China). (Paper presented at the First International Conference of Eurasian Archaeology, University of Chicago, May 3-4, 2002). Retrieved October 19, 2007. ↑ ARCHAEOLOGY AND CULTURAL RELICS, Wanfang Data. Retrieved October 19, 2007. ↑ Thomas Barfield. The Perilous Frontier: Nomadic Empires and China 221 B.C.E. to AD 1757. (Studies in Social Discontinuity) (Oxford, UK: Basil Blackwell, (1989) 1992. ISBN 1557863245.). ↑ Nicola Di Cosmo, "The Northern Frontier in Pre-Imperial China," 885-966. in The Cambridge History of Ancient China, edited by Michael Loewe and Edward Shaughnessy. (Cambridge: Cambridge University Press, 1999). ↑ These campaigns are described in detail by Michael Loewe, "The campaigns of Han Wu-ti," in Chinese ways in warfare, ed. Frank A. Kierman, Jr., and John K. Fairbank (Cambridge, Mass., 1974). ↑ This view was put forward to Wang Mang in 14 C.E. : Han Shu (Beijing: Zhonghua shuju edition) 94B, p. 3824. Retrieved October 19, 2007. ↑ Bibo Zhang and Guoyao Dong. 2001. Cultural History of Ancient Northern Ethnic Groups in China. (Harbin: Heilongjiang People's Press. ISBN 7207033257), 176-225. ↑ Omeljan Pritsak. Die bulgarische Fürstenliste und die Sprache der Protobulgaren. (Wiesbaden: 1955). Ban Gu (班固), Han shu (漢書). 1962. Beijing: Zhonghua Shuju. Fan Ye (范曄) et al., comp. 1965. Hou Han shu (後漢書). Beijing: Zhonghua Shuju. Sima Qian (司馬遷) et al. 1959. Shi ji (史記). Beijing: Zhonghua Shuju. Barfield, Thomas. The Perilous Frontier: Nomadic Empires and China 221 B.C.E. to AD 1757. (Studies in Social Discontinuity) Oxford, UK: Basil Blackwell, (1989) 1992. ISBN 1557863245.
de Crespigny, Rafe. Northern frontier: The policies and strategies of the Later Han empire. Asian Studies Monographs, New Series No. 4, Faculty of Asian Studies. Canberra: Australian National University Press, 1984. ISBN 0867844108. See chapter 1 The Government and Geography of the Northern Frontier of Later Han. (Internet publication April 2004. This version includes a general map and some summary annotations but no characters or detailed notes). Retrieved October 19, 2007.
de Crespigny, Rafe. The Division and Destruction of the Xiongnu Confederacy in the first and second centuries AD. [Turkish: "Hun Konfederasyonu'nun Blnmesi ve Yikilmasi"], being a paper published in The Turks [Yeni TrkiyeMedya Hismetleri-Murat Ocak], Ankara: 2002, 256-243 & 749-757. The Division and Destruction of the Xiongnu Confederacy. Retrieved October 19, 2007. Di Cosmo, Nicola, "The Northern Frontier in Pre-Imperial China," 885-966. in The Cambridge History of Ancient China: From the Origins of Civilization to 221 B.C.E. edited by Michael Loewe and Edward Shaughnessy, Cambridge: Cambridge University Press, 1999. ISBN 0521470307. Hulsewé, A. F. P., and M. A. N. Loewe, 1979. 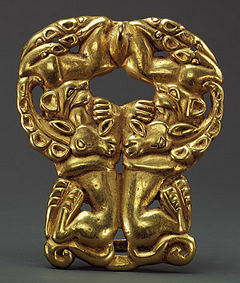 China in Central Asia: The Early Stage 125 B.C.E. – AD 23: an annotated translation of chapters 61 and 96 of the History of the Former Han Dynasty. Leiden: E. J. Brill. ISBN 9004058842. Loewe, Michael, "The campaigns of Han Wu-ti," in Chinese ways in warfare, ed. Frank A. Kierman, Jr., and John K. Fairbank. (Harvard East Asian Series) Cambridge, MA: Harvard Univ. Press, 1974. ISBN 0674125754. Ma, Liqing. 2005. Original Xiongnu, An Archaeological Explore on the Xiongnu's History and Culture. Hohhot: Inner Mongolia University Press. ISBN 7810747967. Perkins, Dorothy. 1999. Encyclopedia of China: the essential reference to China, its history and culture. New York: Facts on File. ISBN 0816026939. Pritsak, Omeljan. Die bulgarische Fürstenliste und die Sprache der Protobulgaren. Wiesbaden: 1955. (Nominalia of the Bulgarian Khans). de la Vaissière, E. 2005. "Huns et Xiongnu." in Central Asiatic Journal 49(1): 3-26. Vovin, Alexander. 2000. "Did the Xiongnu speak a Yeniseian language?." in Central Asiatic Journal 44(1): 87-104. Wang, Zhonghan. 2004. Outlines of Ethnic Groups in China. Taiyuan: Shanxi Education Press. ISBN 7544026604. Yü Ying-shih. 1986. "Han foreign relations." 377-462. in Cambridge History of China: volume 1, The Ch'in and Han empires 221 B.C.E. – A.D. 220. Cambridge: Cambridge University Press, ISBN 0521243270. Zhang, Bibo, and Guoyao Dong. 2001. Cultural History of Ancient Northern Ethnic Groups in China. Harbin: Heilongjiang People's Press. ISBN 7207033257. Hill, John E. (translator) 2004. The Western Regions according to the Hou Hanshu. Draft annotated English translation. Hill, John E. (translator) 2004. The Peoples of the West from the Weilue 魏略 by Yu Huan 魚豢: A Third Century Chinese Account Composed between 239 and 265 C.E.. Draft annotated English translation. This page was last modified on 1 August 2013, at 14:11.